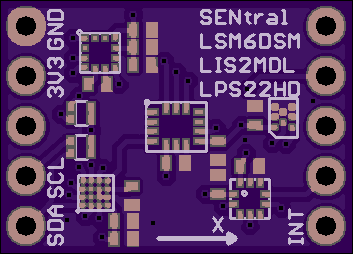 4 layer board of 0.71 x 0.51 inches (17.9 x 12.8 mm). Uploaded: September 10th, 2017 18:49. All-ST version of the EM7180 Ultimate Sensor Fusion Solution including LSM6DSM accel/gyro, LIS2MDL magnetometer and LPS22HD barometer. Corrected magnetometer copper stay out.